Stephen is one of the very first attorneys to receive the award and was chosen from among all of the immigration attorneys in Arizona, Colorado, Hawaii, Nevada, Northern California, San Diego, Santa Clara, Southern California, Oregon, Utah, and Washington! Stephen’s pro bono work includes representing clients in immigration court and before the board of immigration appeals to challenge consular actions and the consular non-reviewability doctrine, working on the amicus committee to write and contribute to briefs that challenge immigration court decisions and advocated for fair and correct interpretations of immigration laws, and empowering the entire ILG staff to volunteer at immigration advocacy events and lead workshops for local immigrants. At ILG we are committed to being advocates for immigrant communities and their families and promoting justice for all people living in the US. 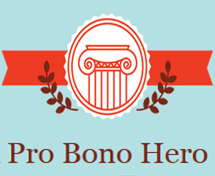 It is a great honor for one of our attorneys to have been named as one of the first Pro Bono Heroes and a testament to our dedicated work in the areas of Oregon and southwest Washington.